My dear brothers and sisters—my dear young friends. There are so many of you here and so many out beyond here. We have been speaking to some very large congregations recently—last Sunday in Guatemala City, 35,199 people. Earlier we were in South America and spoke to 35,000–40,000 in Santiago; 50,000 in Buenos Aires; and so on—crowded in great football stadiums. There is great faith out across the Church: wonderful, devoted people everywhere—some large congregations, some small ones, but everywhere there is tremendous faith in this, the work of the Lord. It is a wonderful thing to see you, my dear young friends, here tonight. When you reach my age, you can call everyone else young, and so I address you as my young friends. It is a great pleasure and a great opportunity to be with you. I compliment you on your presence this evening. We constitute a vast congregation reaching across this entire nation from sea to shining sea and far beyond to many other areas of the world. Your large numbers and your great faithfulness speak of the tremendous growth and vitality of this, the Lord’s church. You are as a great army “marching forth to conquer On life’s great battlefield” (“Behold! A Royal Army,” Hymns, 1985, no. 251). This year we commemorate the 150th anniversary of the arrival of the Mormon pioneers in the Salt Lake Valley. We shall hear much of this during the coming year. There will be celebrations not only in Utah, but likewise among our people everywhere. It is proper that we pause to pay reverent respect to those who laid the foundation of this great work. In a larger sense we honor all of those who made the long journey from Nauvoo to the Missouri River beginning in 1846, and from there and other places beginning in 1847 to these western valleys. They came from Nauvoo, they came from the British Isles, and they came from the nations of Europe. Their grand objective was Zion. They sang about it. They dreamed of it. It was their great hope. Their epic journey must stand forever as an incomparable undertaking. The movement of tens of thousands to these valleys of the West was fraught with every imaginable hazard, including death, whose grim reality was familiar to every wagon train and every handcart company. I stand in reverent respect for Brigham Young. He saw the Salt Lake Valley in vision long before he saw it with his natural eyes. Otherwise I doubt he ever would have stopped here. There were greener lands in California and Oregon. There was deeper and richer soil elsewhere. There were great fields of timber in other places, much more water, and climates more equable and pleasant. There were mountain streams here, it is true, but none of them was very large. The soil was totally untried. No plow had ever broken its hard-baked surface. I marvel, I simply marvel, that President Young would lead a large company here to a place where there never before had been a sowing and a harvest. He had to have had a vision. He had to have had revelation that there could be sustained in these valleys a substantial and growing population. When he arrived here he said, “This is the right place.” This very statement indicates that he knew it when he saw it. Joseph Smith had seen Ensign Peak in vision. Two days after Brigham Young’s arrival, with some of his brethren, he climbed the peak and there, in the words of Isaiah, unfurled “an ensign to the nations” (Isaiah 5:26). It may have only been a pocket handkerchief that was used, but it was indicative of a great millennial vision on the part of these leaders. I am convinced they saw not just 1847, but the planting and growth of this work through the years to come. They were travel-worn, these pioneers. It had taken 111 days to bring them from Winter Quarters to the Salt Lake Valley. They were tired. Their clothes were worn. Their animals were jaded. The weather was hot and dry—the hot weather of July. But here they were, looking down the years and dreaming a millennial dream, a grand dream of Zion. You are familiar with their story. You are the fruit of all of their planning and of all of their labors. Whether you have pioneer ancestry or came into the Church only yesterday, you are a part of this whole grand picture of which those men and women dreamed. Theirs was a tremendous undertaking. Ours is a great continuing responsibility. They laid the foundation. Ours is the duty to build on it. They marked the path and led the way. Ours is the obligation to enlarge and broaden and strengthen that path until it encompasses the whole earth. What a marvelous thing it is to have a great heritage, my brothers and sisters. What a grand thing to know that there are those who have gone before and laid out the way we should walk, teaching those great eternal principles that must be the guiding stars of our lives and of those who come after us. We today can follow their example. The pioneers were people of great faith, of tremendous loyalty, of unthinkable industry, and of absolutely solid and unbending integrity. During the 22 years of the pioneer movement, from the first company of 1847 until the arrival of the transcontinental railroad in 1869, there were tens of thousands of them who gathered here from all over the earth. They were all part of a wonderful cause, The Church of Jesus Christ of Latter-day Saints. They believed in the gospel that had come through the Prophet Joseph Smith. Thousands of them died along the way, many of them buried in unmarked graves never visited by any of their posterity. They gave their lives, their very lives—than which there is no greater sacrifice—for this cause in which they believed. They walked through the refiner’s fire for the privilege of coming to these desert valleys. Their faith was unshakable. In fulfillment of the prophecy of Jeremiah, they had been gathered “one of a city, and two of a family” and brought to Zion to be fed by pastors after their own hearts (see Jeremiah 3:14-15). The winter of 1848–49 was quite cold. Many people had their feet badly frozen. . . . As the days grew warmer the gold fever attacked many so that they prepared to go to California. Some said they would go only to have a place for the rest of us; for they thought Brigham Young too smart a man to try to establish a civilized colony in such a “God-forsaken country,” as they called the [Salt Lake] valley. . . . It was at this time of gloom that President Young stood before the whole people, and said, in substance . . . : “Some have asked me about going. I have told them that God has appointed this place for the gathering of his saints, and you will do better right here than you will by going to the gold mines. Some have thought they would go there and get fitted out and come back, but I told them to stop here and get fitted out. Those who stop here and are faithful to God and his people will make more money and get richer than you that run after the god of this world; and I promise you in the name of the Lord that many of you that go thinking you will get rich and come back, will wish you had never gone away from here, and will long to come back, but will not be able to do so. Some of you will come back, but your friends who remain here will have to help you. . . .
“We have been kicked out of the frying pan into the fire, out of the fire into the middle of the floor, and here we are and here we will stay. God has shown me that this is the spot to locate his people, and here is where they will prosper; he will temper the elements for the good of his Saints; he will rebuke the frost and the sterility of the soil, and the land shall become fruitful. Brethren, go to now, and plant out your fruit seeds. . . . I would like to say that we are a very rich and blessed people. Notwithstanding the temptation to go to the California goldfields, where the entire world seemed to be rushing, the people accepted their leader’s words. They stayed here and grubbed the sagebrush and made their way. Brigham Young’s prophecy has been fulfilled. This is now a great and beautiful and fertile area. It has become the Crossroads of the West. Thousands and tens of thousands and hundreds of thousands pass this way constantly. We in the Office of the First Presidency are called upon day after day and week after week to meet the great of the earth. Faith was the guiding principle in those difficult days. Faith is the guiding principle we must follow today. From this valley we have now spread across the nation and across much of the earth. We can change our place of residence, but we must never change the principles that guide us. There must be faith as a predominant factor in our lives as it was in the lives of those who have gone before us. Heber McBride, then 13 years old, traveled to the Salt Lake Valley in the Martin Handcart Company in 1856 with his parents, Robert and Margaret, and four brothers and sisters. The following incident, found in his memoirs, occurred one day after the company crossed the North Platte River, just west of present-day Casper, Wyoming. “That evening as we crossed the Platte River for the last time it was very cold. The next morning there was about six inches of snow on the ground, then what we had to suffer can never be told. Father was very bad and could hardly sit up in the tent. . . . I managed to get Father in one of the wagons. That was the last we ever saw of him alive. . . .
“[That evening] the snow was getting very deep and my sister and me had to pitch our tent and get some wood, but there were plenty of dry willows. After we had made mother as comfortable as possible, we went to find father, but the wind was blowing the snow so hard we could not see anything. . . . We did not find father that night. “There we were, away from everything, away out on the plains with hardly anything to eat or wear, and father dead and mother sick; a widow with five children and hardly able to live from day to day. After I had my cry out I went back to the tent and told mother and the children. To try to write my feelings is out of the question. “We were not the only family called upon to mourn the loss of a father that morning, for there were thirteen men dead in camp. In those terrible, terrible circumstances they were loyal one to another. When they were sick, they nursed one another. When they died, the whole company worked together to bury them against the marauding wolves. Absolutely unspeakable was the suffering of the James G. Willie Company, the Edward Martin Company, and the Hunt and Hodgett wagon trains in that terrible ordeal in the snow in 1856. But notwithstanding death, notwithstanding frostbite, notwithstanding meager rations, they pressed forward to reach Zion. Loyalty to one another and loyalty to the Church marked their actions. God be thanked for their great and noble example to each of us. My brethren and sisters, we must be loyal. We cannot be found on the sidelines carping and criticizing and finding fault with one another. We must help one another with each other’s burdens. We must share the sorrows of one another. We must rejoice with one another in our victories. We must be loyal to the Church against all its enemies. “Who’s on the Lord’s side? Who? Now is the time to show. We ask it fearlessly: Who’s on the Lord’s side? Who?” (“Who’s on the Lord’s Side?” Hymns,1985, no. 260). The pioneers were men and women of tremendous industry. It took six months for many of them to get here. Not long ago I was in Liverpool and went down to the old Liverpool docks from which many of them left. There, preserved in a museum, are the registers of the immigrant ships that brought our people here. They were slowgoing sailing vessels for the most part. They braved the storms of the Atlantic. Many of them then traveled to New Orleans, up the Mississippi to St. Louis, and up the Missouri to Florence, Nebraska, where they began the long overland trip west. It was work, work—unrelenting work. And then when they arrived here, the real labor began. They grubbed the sagebrush, they plowed the sun-baked soil, they led the waters from the mountain streams onto the soil, they planted their crops, they fought the destructive insects that attacked those crops, and with great labor they gathered in the harvest. The Utah State seal shows the beehive—the Book of Mormon representation of the honeybee—and it carries the word industry. We too must work. Nothing happens in this world until there is work. You never plow a field by turning it over in your mind. You have to put your hands to the handles of the plow and walk forward. It is easier now, but the principle is the same. There must be work, and what a great and wonderful blessing that is. They had very little money. They had no assistance from the government. They had to produce what they ate, and if they did not produce they would not eat. What a dismal station we have reached in this nation where we have borrowed and spent and failed to repay. At the close of 1994, every man, woman, and child in the United States owed as his or her part of the national debt $17,805.64. Think of it. It is a disgrace. It affects all of our monetary policies and all of our commerce. It burdens us with taxes from which there is little or no relief. That statement of frugality and thrift served them well. We could learn a lesson from their example. They were men and women of integrity. Repeatedly it has been said that their word was their bond. They performed as they promised. They were honest, true, benevolent, virtuous. They were men and women who kept their word. There were few if any lawyers in those days. The people in large measure lived the Golden Rule: “Therefore all things whatsoever ye would that men should do to you, do ye even so to them” (Matthew 7:12). Now we live in what is called the world’s most litigious society. People are at one another’s throats constantly. It seems almost that the filing of lawsuits has become a national pastime. What a disgrace that we cannot get along with one another as they got along with one another. Those of you who read the daily papers must surely recognize that no longer do we seem to care very much about the principles or the behavior of a candidate who runs for political office. We have dishonesty in high offices in the land. How seriously we have fallen. In all this world there is no substitute for personal integrity. It includes honor. It includes performance. It includes keeping one’s word. It includes doing what is right regardless of the circumstances. Am I an impractical idealist concerning the pioneers? No. There were exceptions here and there, but by and large they were a noble and wonderful people who walked in faith, who lived with loyalty, who were industrious, and who worked with integrity. Shining above all of their principles and ideals was their solemn and wonderful belief in the Lord Jesus Christ as their Savior and their Redeemer. They knew him. He walked with them on that long march to the Elkhorn, up the Platte, beside the Sweetwater, over the Continental Divide, and down through the dry and desert country to this valley of the Great Salt Lake. He was their friend. They offered their prayers in his name. They sang to his glory. With humble appreciation they spoke of his great atoning sacrifice. They put their faith in him. “And should we die before our journey’s through, Happy day! All is well! We then are free from toil and sorrow, too; With the just we shall dwell!” (“Come, Come, Ye Saints,” Hymns, 1985, no. 30). Such was their belief. Death was tragic for those left behind. But they knew there would be another day, a day of happy reunions. “But if our lives are spared again To see the Saints their rest obtain, Oh, how we’ll make this chorus swell—All is well! All is well!” (“Come, Come, Ye Saints”). What a wonderful people they were. There is nothing like their great effort in all of history. There have been other great migrations. There have been many great causes for which men have given their lives. But in our time, within the span of our memory, stand these noble pioneers. God bless their memory to our good. When the way seems hard, when we are discouraged thinking all is lost, we can turn to them and see how much worse was their condition. When we wonder about the future, we can look to them and their great example of faith. Let us during this sesquicentennial year, my dear friends, go back and read again their epic story. With so great an inheritance, we must go forward. We must never let down. We must hold our heads high. We must walk with integrity. We must “do what is right [and] let the consequence follow” (“Do What Is Right,” Hymns, 1985, no. 237). May the Lord bless you, my dear friends, wherever you may be. May you go forward with your lives with great faith, with unyielding loyalty, with industry, and with noble integrity, is my humble prayer in behalf of each of you, in the name of Jesus Christ. Amen. 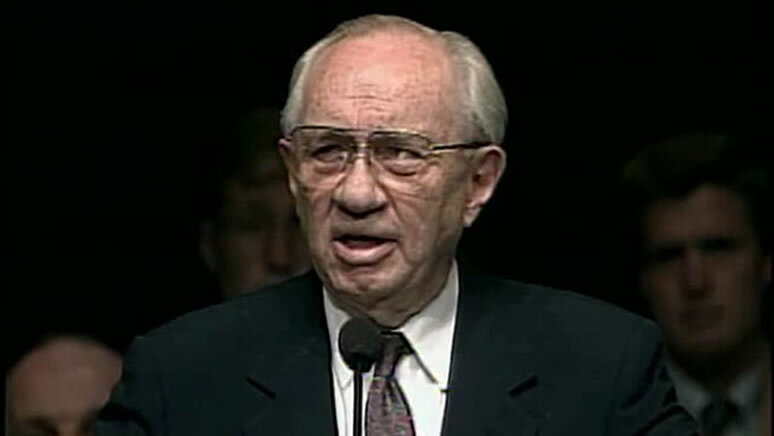 Gordon B. Hinckley was the president of The Church of Jesus Christ of Latter-day Saints when this fireside address was given at Brigham Young University on 2 February 1997.